Yesterday I came across this video that demonstrates how to make Glowing Sushi, using genetically modified zebrafish to produce a fluorescent “kryptonite roll”. When I first watched the video, my main question was: Why would you want to use fluorescent GFP fish in sushi?! You would have to shine a UV light on your sushi roll while you eat it in order to get the glow effect. 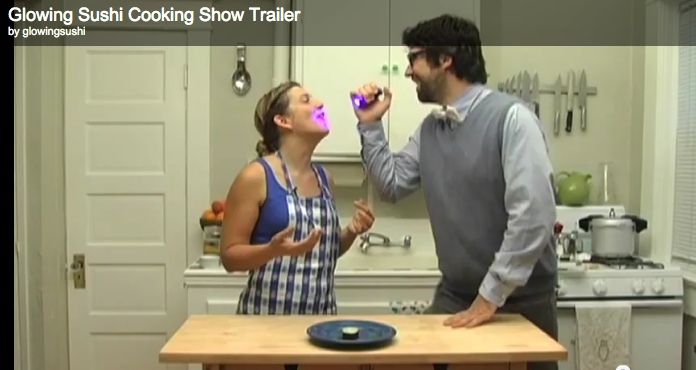 Surely there are better ways to enjoy your food than lighting a UV torch into each others mouths to see glowing chewed food. I also felt a bit annoyed. Things like this “kryptonite sushi” and the pet glow fish don’t seem to have a specific purpose other than to “look cool” and sell as product. I feel very protective of fluorescent protein technology, as it is such a powerful and important tool in cell biology, in fundamental research, medical applications and in all fields, from bacteria to yeast, plants and animals. I worry that gimmicks like this further fuel the image of “mad scientists hiding in their labs and creating glow-in-the-dark animals for their amusement”. Upon further research I found out that the video was produced by “The Centre for Genomic Gastronomy“, which is well worth a visit. Their video certainly manages to engage people – I found it on Google+ and it appeared to spark a number of comments whenever it was shared. I think though that the video would have benefitted from having a link to the Centre in the credits. It puts it into a very different context and might spark a deeper debate than just having people go “ZOMG I WOULD NEVER EAT THAT! “. The Center for Genomic Gastronomy is an independent research institute engaged in exploring, examining and understanding the genomes and biotechnologies that make up the human food systems of planet earth. We are dedicated to the advancement of knowledge at the intersection of food, culture, ecology and technology. The Center presents its research through public lectures, research publications, meals and exhibitions. What do you think? Would you eat kryptonite sushi?